When we left the Brothers Magnus, they had assembled in Cardice to help Anton Magnus defend the castle from attack by a neighboring state with a significant military advantage and several officers who, at any moment, could request help from saints - or, depending on your perspective, from the devil. But Cardice has a secret weapon in the form of young Wulfgang Magnus, who can ask a few favors of his own from these devil-saints. The only problem is that Wulf is in love with Madlenka, the countess from Cardice who was forcibly married to Anton to explain why he’s suddenly leading the country. Even Wulf is unsure if family and political loyalty should override love. He’s also beginning to realize that the magical battle he’s stepped into has some serious rules that he doesn’t know, and has no way to learn. And when several wild cards in every battle can tap into nearly limitless sources of magic, who knows how far and wide the battle might range? This stunning continuation of the story begun in Speak to the Devil amps up the romance and intrigue, while letting readers spend more time with master fantasist Dave Duncan’s unique, complex, and ornery-but-delightful characters. When the Saints is a Kirkus Reviews Best of 2011Science Fiction & Fantasy title. 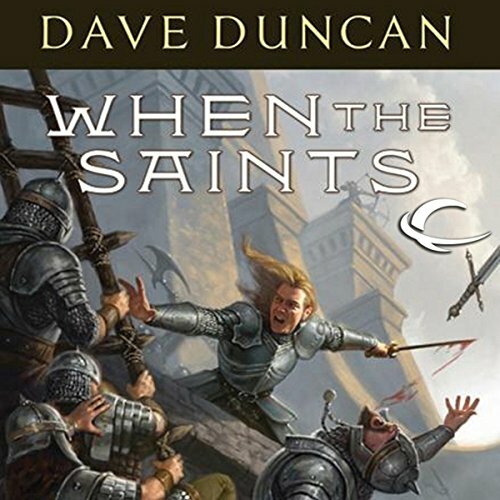 ©2011 Dave Duncan (P)2012 Audible, Inc.